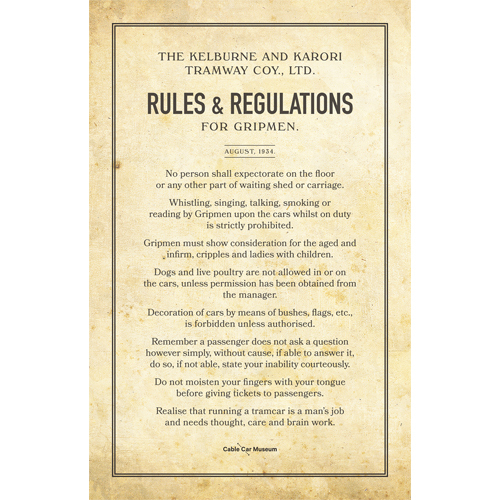 The Gripmen Rules tea towel makes the perfect souvenir for anyone who has enjoyed a ride up the Cable Car. Re-live the strange rules of the cable cars past. In 1934, Gripmen received a notebook responsible for operating the grip cars that climbed the hills to Kelburn. The book had to be kept on them at all times because it provided instructions of their job. These included from dealing with a breakdown, to coping with passengers. Many of the rules can sound ridiculous to a modern mind. A copy of this rule book is a part of the Museums Wellington collection, and you can now purchase your own faithful recreation of a page. Perfect for drying your dishes, or for those who like to keep their hands clean and dry, perfect to frame and hang on the wall. It is 100% cotton and measures 75cm x 49cm. Customers can also purchase this product in store at the Cable Car Museum. This item is exclusive to Museums Wellington and is part of their Gripmen range. It celebrates the history of Wellington’s iconic Cable Car. The Blue XS METRO BLUNT Umbrella, designed in New Zealand, is a revolution in umbrella design creating the ultimate defense against the elements.